Armies of technology vendors seem to be converging on the wealth management industry offering cloud-based services to automate every task a financial advisor could ever think of. These tools can help advisors connect and communicate with clients and prospects anywhere in the world. But which ones are best for your needs? The myriad choices can be overwhelming. Riding to the rescue is Bill Winterberg, founder and president of FPPad.com. He gave a presentation at the Technology Tools for Today (T3) 2015 Conference – Advisor Edition called ‘Digital Advice Delivery: Tools Your Business Needs Today to Deliver Advice in the Digital Age’. Any advisor looking for help selecting the right tools to enhance their practice should have attended this session. But in case you weren’t able to be there in person, we have a summary of it right here! Bill Winterberg is a respected personality in the financial planning industry. He is widely recognized as an independent authority on the subject of technology in financial services. Prospective clients are going to search for you online first, most likely via one of the “big four” social media platforms, Winterberg explained. Advisors should make it easy for to be found and control what information prospects see. Google+ – much smaller user base than others, but posting here will improve your Google search results and helps to cast a wider net. According to the Pew Research Center, 71% of US adults use Facebook, 28% use Linked in and 23% use Twitter. 52% of online adults now use two or more social media sites. This means it is important to expand your online distribution to more than one outlet. Whichever ones you choose to engage in, you have to make it a habit that you do at least a few times a week, if not every day. Allowing yourself to engage in social media in a haphazard fashion is a sure way to get no results. you need to post information that will be relevant an interesting to the type of prospects that you want to attract. If you have a market niche of startup owners you should post information that is relevant to them. Articles on funding, hiring and marketing for startups would all pique the interest of these people. One goal of using social media is to give prospects a sense of who you are. Help prospects make the decision to perform due diligence on you instead of moving on to the next advisor they find online. Before getting started on social media or a website, you must ensure that your Compliance Officer has approved your efforts and is archiving everything you post, Winterberg noted. Signing up with a social media compliance vendor is the best way to ensure your firm does not run afoul of applicable state and federal laws. FINRA, SEC, Sarbanes-Oxley, Gramm-Leach-Bliley, FERC, NERC, and HIPAA might all be applicable to your firm. A robust social media archiving solution can take you beyond simple data retention. It can improve the effectiveness of your marketing, enhance your ability to attract new prospects, and increase your conversion rate of new clients. Winterberg pointed out that none of the firms he listed were attending the conference. He lambasted them for avoiding the opportunity that T3 offered them since he was telling a roomful of advisors to go and talk to them! One other vendors that Winterberg did not mention was Hearsay Social, which recently won 2nd place from FTF 2015 for Social Media and Compliance Solutions. Reports on which content is having the most impact on your audience. Hootsuite offers a service called Social Compliance for financial services professionals, which is a partnership with Global Relay, a cloud-based message archiving, search, and surveillance tool for the financial services industry. Disclaimer: I use Hootsuite as my primary social media dashboard, although I do not use the Social Compliance functionality, since I’m a consultant and not regulated by any government agency. Your website should have a well-organized and attractive home page. When prospects visit, they must be able to get an understanding of what you and your value added within the first minute. If it takes longer than that, you will probably lose them, Winterberg warned. Video is has become a popular tool for explaining products and services to prospective clients. Advisors can use a short video to explain what they do and how their clients benefit. 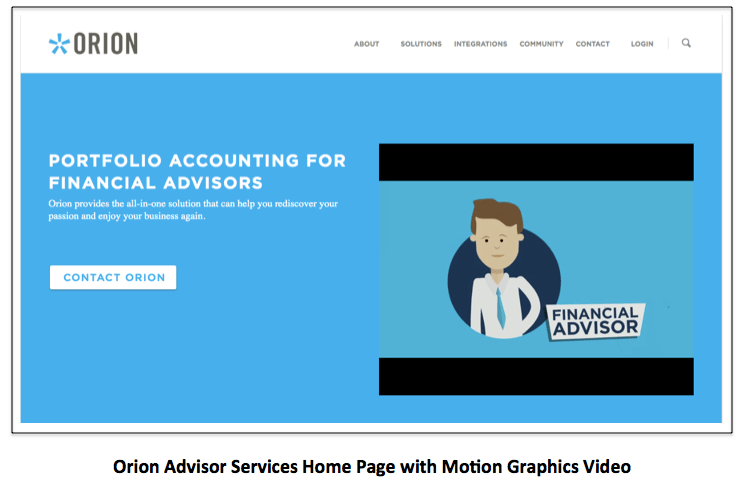 Winterberg provided an example using the home page of Orion Advisor Services, which has a video created using cartoon characters and graphics to illustrate how their company can assist advisors. Prospects will judge an advisor by the quality of their website as well as what they say on social media, Winterberg emphasized. At the next stage in the client acquisition process, when a prospect becomes a lead, it is important to give them the opportunity to engage with your firm and get more information, Winterberg told us. Even if they currently do not have a pressing financial issue and are not ready to sign up, they have still express an interest in you. How can advisors stay in contact with leads and keep them “warm” until they are ready to make a decision? Email newsletters are an excellent medium for communicating your message, Winterberg pointed out. They are not just for clients! Newsletters can create a different segment for prospects to cultivate leads with content that matters to them. Email newsletters are an excellent medium for communicating, Winterberg pointed out. They are not just for clients! There are a number of vendors in the online marketing space that have easy to use software for managing the creation and distribution email newsletters. All of them offer free trials or pay-as-you-go plans that fit within even the smallest firm’s marketing budget. 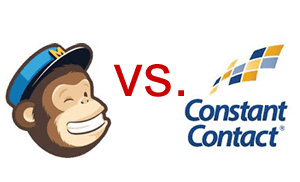 I have used Campaign Monitor in the past and currently use MailChimp, so I speak from experience when I say that both have well-designed user interfaces that make it simple to design and send out email to large groups of people. If you already publish a newsletter for clients, these tools allow you to create a new segment just for prospects. You can send them both the same content, reducing your workload, but track their responses separately. This will allow you to cultivate your leads and know exactly which of your content interests them most. Advisors have lots of meetings. Meetings with clients, meetings with prospects, meetings with referral partners and meetings with staff. This makes for a very busy calendar. Of course, your clients and prospects are busy, too! Having to exchange emails back and forth to find a mutually available time can be tedious, Winterberg observed. Online scheduling services can facilitate the coordination required to schedule meetings. A button or link can be placed on your website or in your email that the prospect or client clicks to access the scheduler. They can see your calendar and select an open time slot. You are automatically notified when a new appointment is added to your calendar. They all have websites as well as mobile apps so you always have access to your schedule. Advisors should also ditch “wet signatures” and move their practices entirely to esignatures, Winterberg advised. All the major custodians and broker-dealers support esignatures. If yours does not, then you should “turn up the heat on them” he stressed. Screencasting is creating a recording of your computer screen while you go through a presentation, document or other online information. The recording can be shared over the Internet and provides valuable content that prospects or clients can review at their convenience. Once you create the screen recording, you will need another service to host the distribution and control consumption. Options such as LinkedIn, your own YouTube channel, or a Vimeo channel are all good options, Winterberg described. It is important to assign good keywords and descriptions to your online content, since this will improve your search engine rankings. This content will become another avenue for prospects to find you online, Winterberg pointed out. Bill Winterberg is the guru of gurus when it comes to technology tools for financial advisors. I would recommend that everyone check out his blog at FPPad.com. You should also sign up for his video newsletter called Bits and Bytes, which provides a weekly update of great information and product reviews. Great article. I agree with your point about the importance of starting with the website before moving on to other pieces of fintech. Too many advisors sign up for a host of technology services but then forget to hub and integrate them into a website that is mobile-responsive and up-to-date. Or they have an updated website but don’t provide a good user experience so the tools don’t end up being as useful as they could be. It is always best to think about your overall business goals and how they relate to your social media and digital marketing efforts before getting started, and then communicate those to your web developer or keep them in mind as you refresh your site and integrate these tools. Another option for web and social media archiving is PageFreezer. While the requirements such as FINRA and SEC compliance seem to be getting stricter all the time it’s great that there are all these tools that make keeping accurate, provable records easier! Thanks for the mention Craig. There are lots of great tools out there to help advisors. It’s interesting times in the industry.